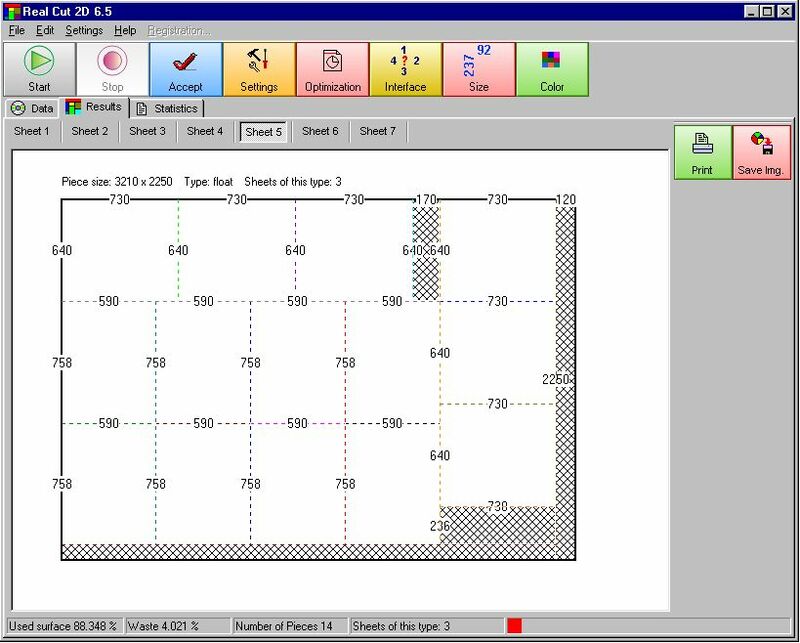 Real Cut 2D is a computer program used for obtaining cutting layouts for two dimensional surfaces.Real Cut 2D can be used for cutting rectangular sheets made of glass, wood, metal, or any other material used by industrial applications.Features:Any number of pieces in the REPOSITORY and DEMAND.Any measurement metric.Adjustable cutting blade thickness.Adjustable optimization level.Fractional input (100 1/2 or 100.5).Graphical display (black-white or color) and text mode of the obtained results.Printing the obtained layouts.Printing the REPOSITORY and the DEMAND of the customer.Several statistics related to the current optimization.Automatically computing of the sheets price.Password protected REPOSITORY.The DEMAND can be exported/imported into/from Excel.The REPOSITORY can be exported into Excel files.Sortable REPOSITORY and DEMAND using different criteria.Information about customers can be stored with every DEMAND.Managment of different types of material.Very fast running time (Solutions are obtained within seconds).Interface in multiple languages: English, French, German, Spanish, Italian, Romanian, Portuguese, Swedish and Dutch. Create tickets and forms of all types. Design labels, coupons, gift certificates, or any document that requires text, graphics, or serial numbering. Create and print your project from your desktop in minutes with our easy to use interface. Tipard PDF Joiner is the most professional PDF Merger to help you merge several PDF files into one. It provides you with an intuitive interface to make the operation quite easy. And You can select the page range and page sort. Retailers, supermarkets, stores, malls, trade shows, parties and games are a perfect place to use a prize wheel. With the fun environment it brings to the event, it is a sure way to keep the atmosphere fun and exciting.